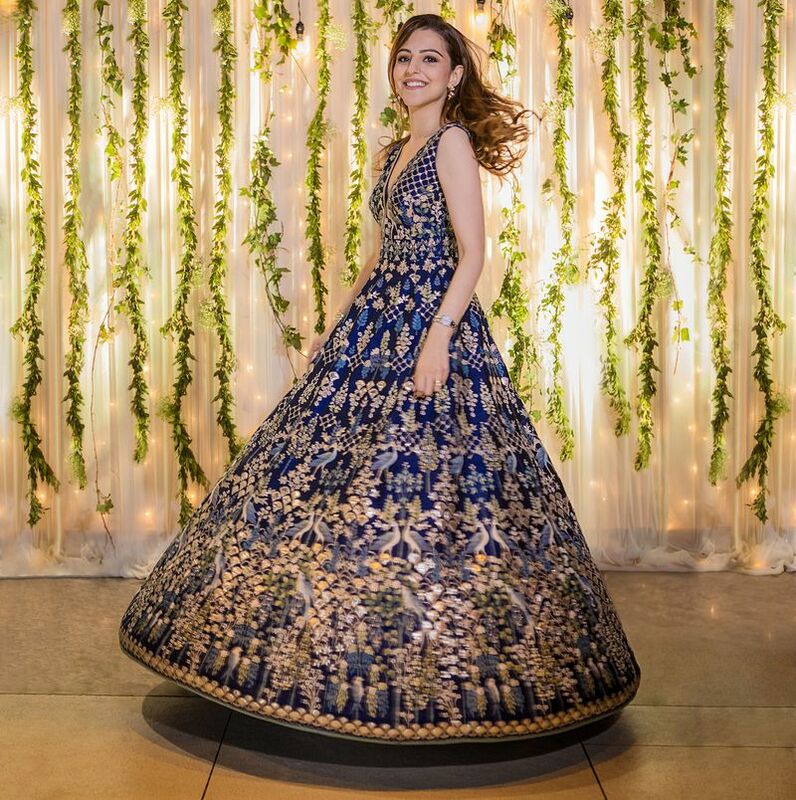 When your mother is a global designer of the calibre of Anita Dongre, then how can the wedding not have the most amazing outfits? 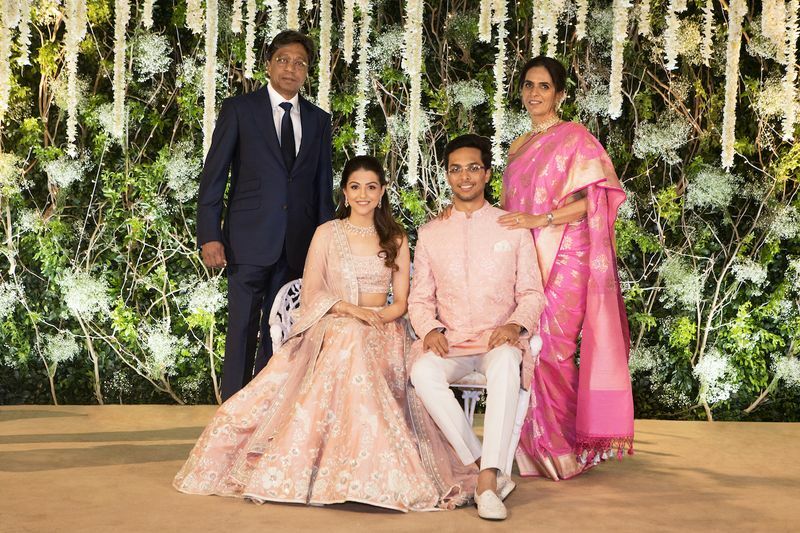 And the best part was, they still managed to keep the 'intimate' vibe intact with everything to do at the wedding despite some spectacular outfits and splendid decor. 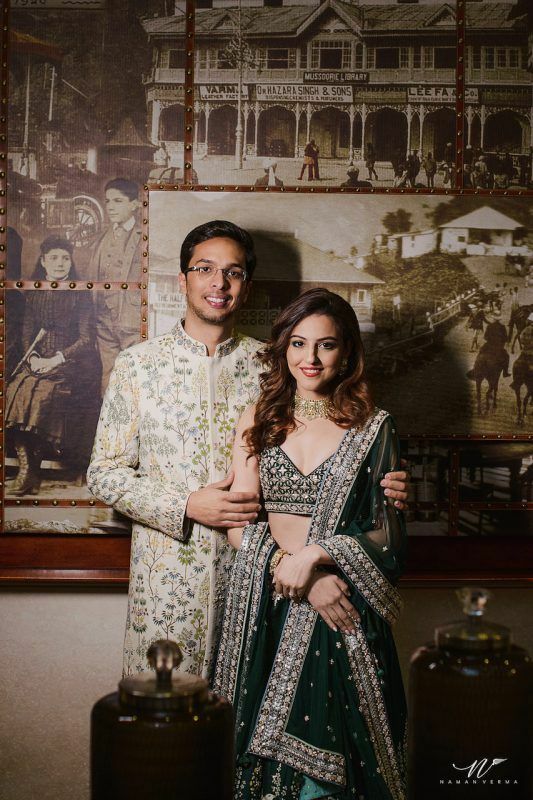 Yash and Benaisha's two-city wedding had some many amazing moments! 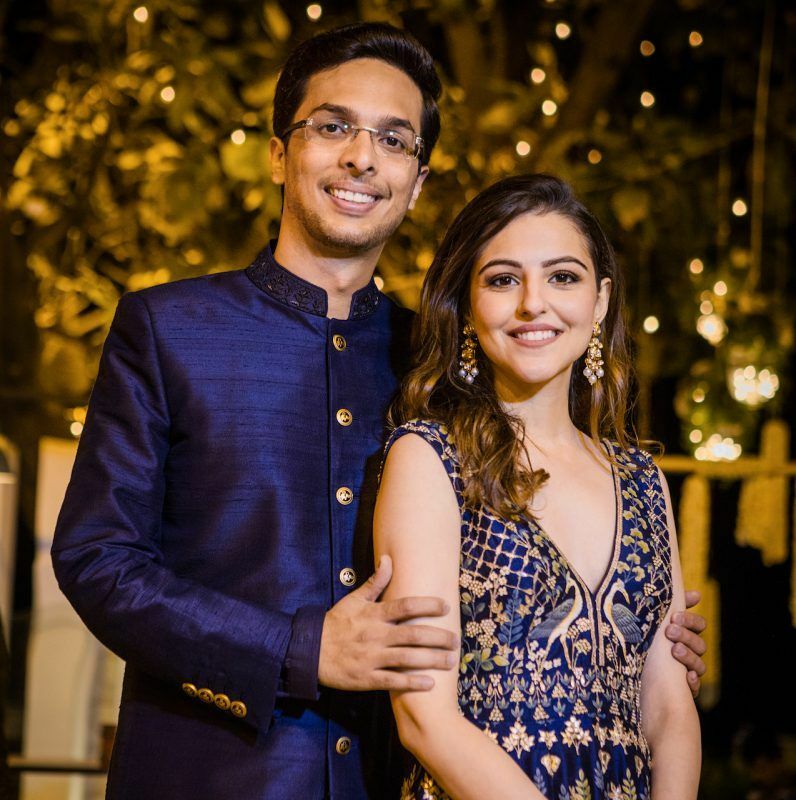 They tied the knot in Mussourie at the JW Marriott Mussoorie Walnut Grove Resort & Spa, which was intimate with only friends and family, which was then followed by a bash in Mumbai. 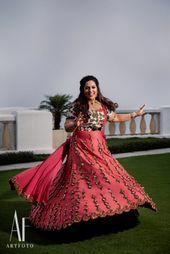 The photos captured by Naman Verma Photography★ 5 are gorgeous as always! 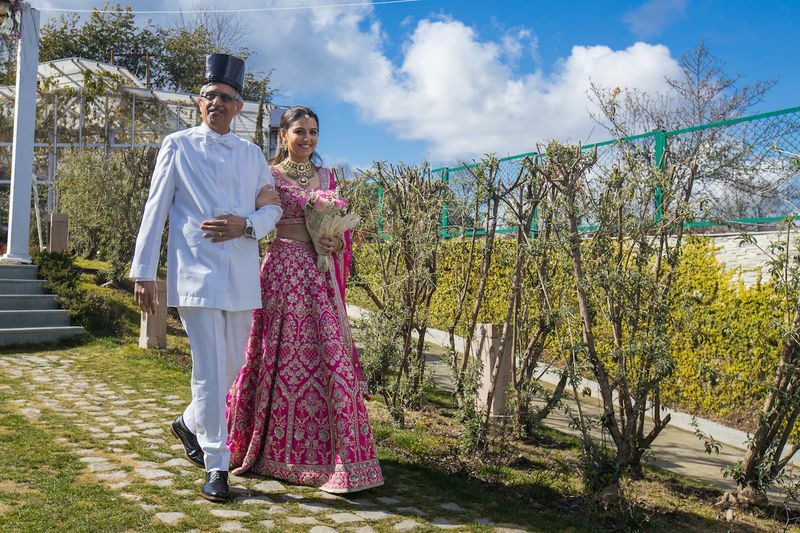 In an Instagram post by her, Anita Dongre says, "For us, it was a no brainer to choose a wedding destination that paid homage to India’s untapped beauty. 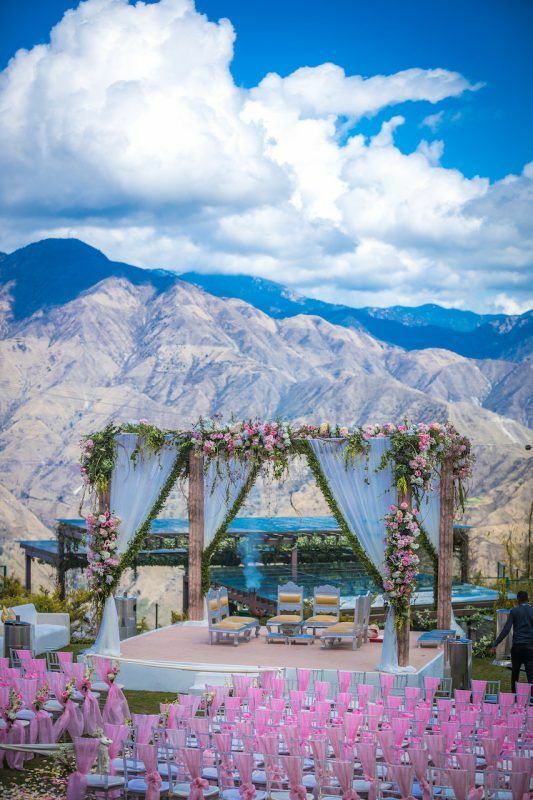 We zeroed in on Mussoorie for the couple to be married amidst nature, embraced by lush forests and with a backdrop of the Himalayas." 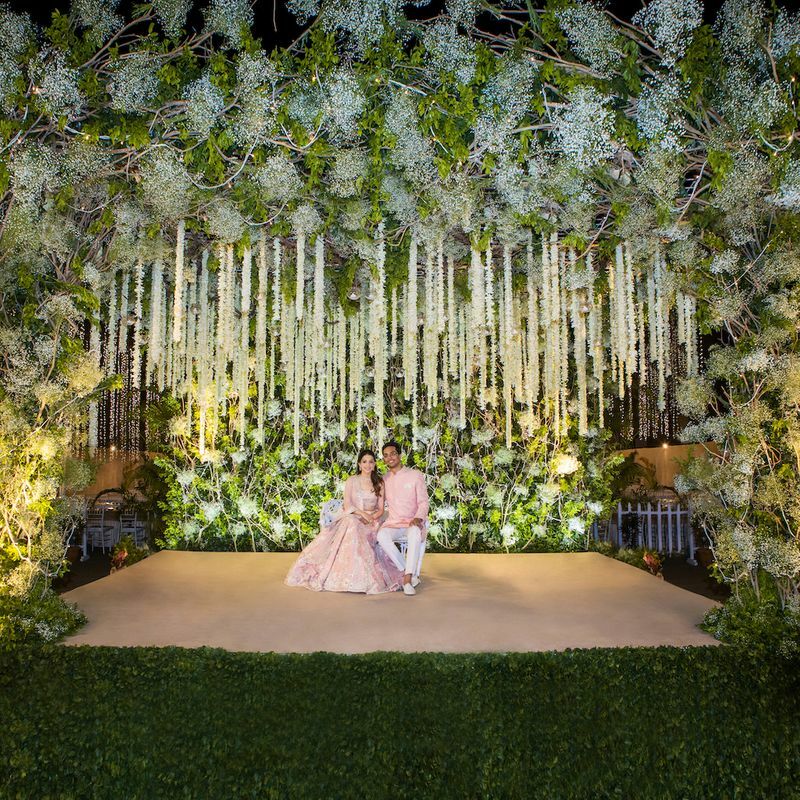 The couple as well as Dongre herself was involved in the wedding planning, especially the decor. All of the events had a forest/rustic vibe to them, and the lights were warm and soothing. 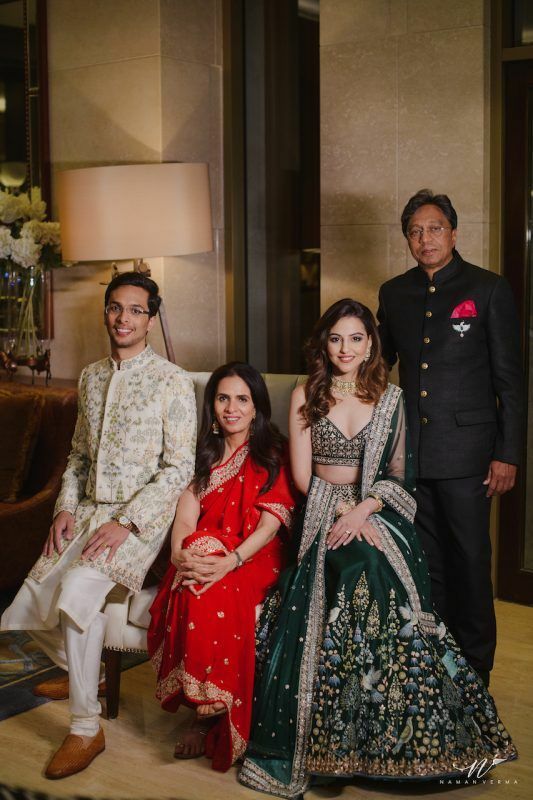 The colours were neutral; black and gold with white for the sangeet. For the welcome dinner, they played with navy blue and black upholstery. Benaisha’s fondness for inspirational quotes was also curated into the wedding décor. 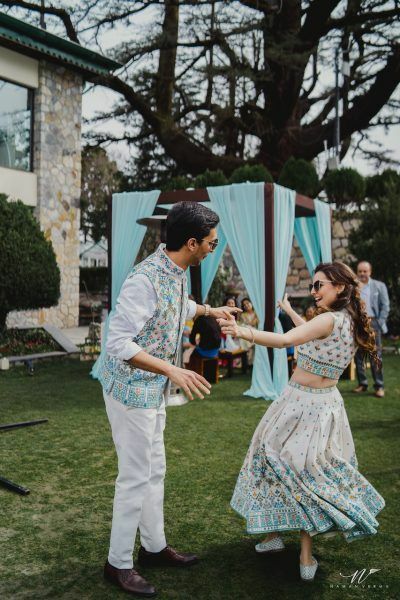 Of course, the couple obviously chose custom designs from Anita Dongre for all occasions. 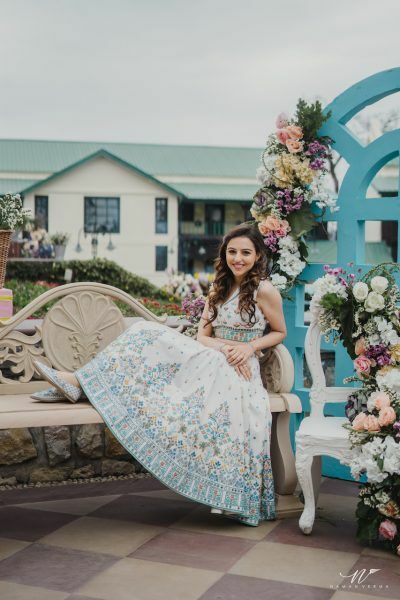 The festivities began with a welcome dinner on March 1, 2019, at the main wedding venue, JW Marriott Mussoorie Walnut Grove Resort & Spa. The next day saw a carnival-theme brunch party at the ITC WelcomHotel The Savoy, Mussoorie. 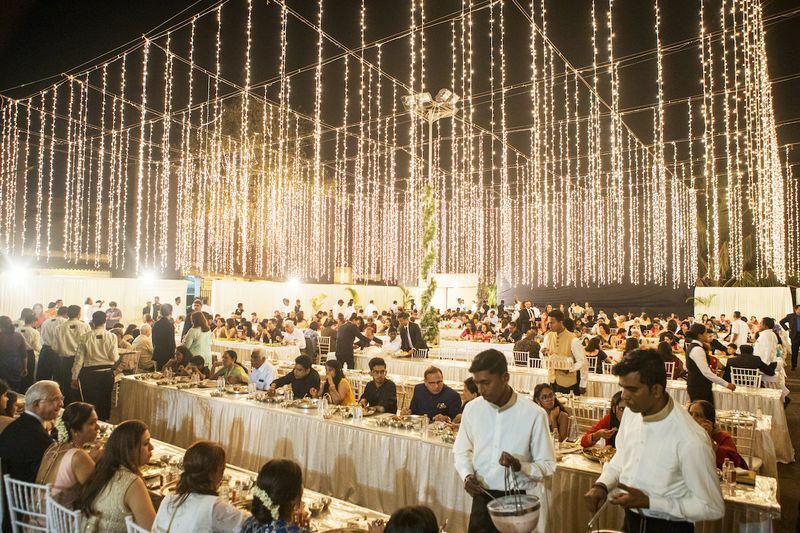 They had a life-sized game of snakes and ladder, hopscotch, ring the bottle, beer pong, along with a palmist, someone to put mehendi for the women, astrologist, acrobats, a photo booth and even candy floss and popcorn counters. They also added food stalls to this event to give it a carnival feel, serving delicacies like Turkish ice cream, chola kulcha, sliders, etc. 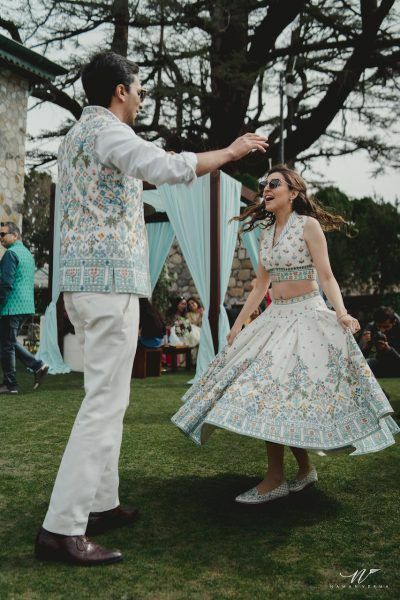 According to Anita Dongre, "High on the couple’s priority list was wearability and comfort in their attire. Keeping their outfits lightweight and fuss-free allowed them the freedom to spend quality time with friends and family." 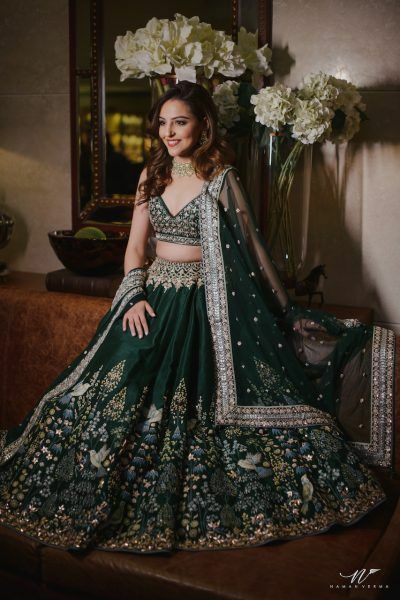 As per Anita Dongre, "For the sangeet, Benaisha chose an emerald green lehenga embellished with intricate hand painted pichhwai work and Yash in a twinning hand painted pichhwai sherwani with nature motifs to match." 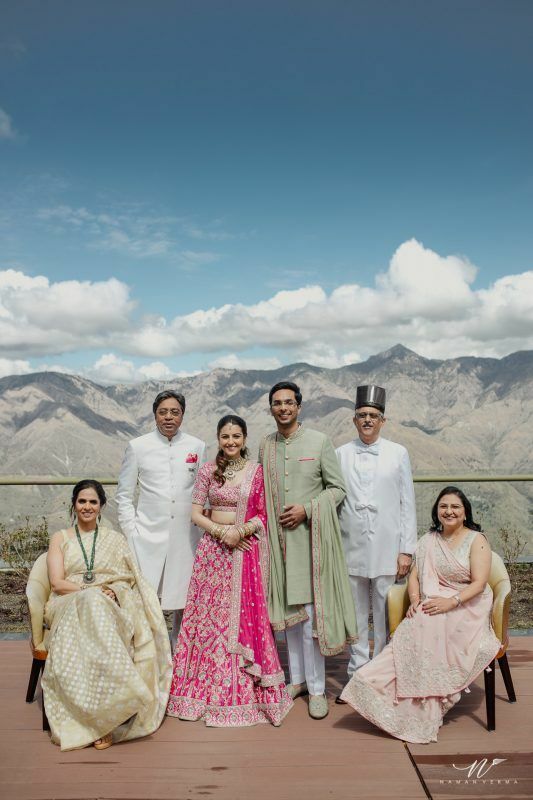 In an Instagram post, Anita Dongre wrote, "Nestled in the Shivalik Mountains, the wedding was an intimate affair that we tried to keep minimalistic yet inviting, with rustic verdant flower arrangements reminiscent of spring summer vibes." 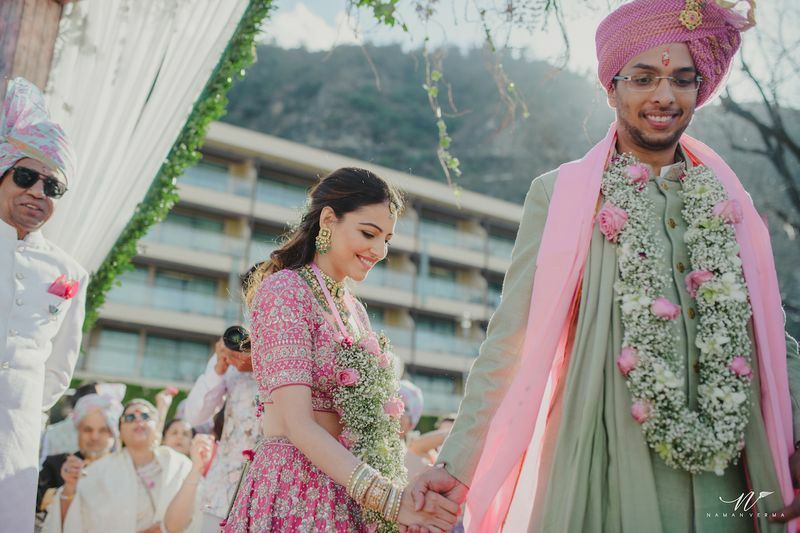 The day commenced with a baraat, where “Benaisha chose to walk down the aisle with her father, in a cultural coming together of the Hindu and Zoroastrian faiths,” said Dongre. 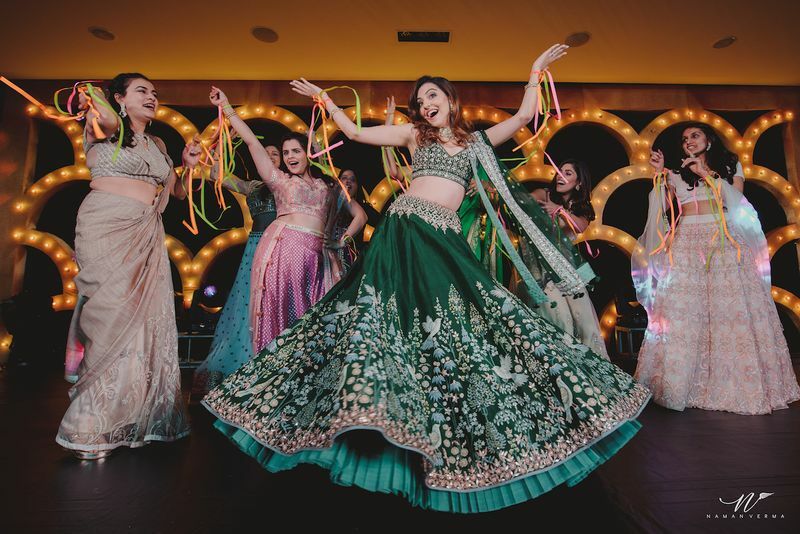 "With friends like family, it was important to Yash and Benaisha that their groomsmen and bridesmaids wear coordinated ensembles for the wedding ceremony." 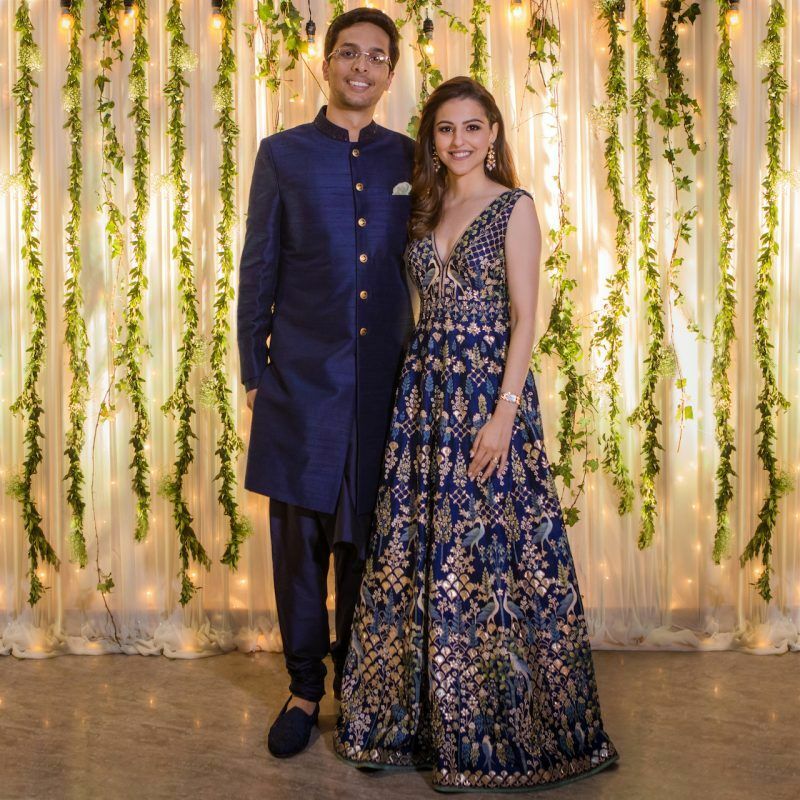 Dongre explains, "Benaisha’s ink blue gown with intricate pichhwai work was complemented by Yash’s classic sherwani, at their Mumbai cocktail. 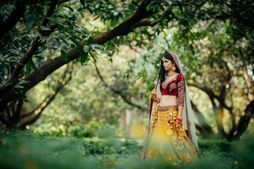 The traditional craftwork on the bride’s gown was designed in deliberate contrast to its Western silhouette." 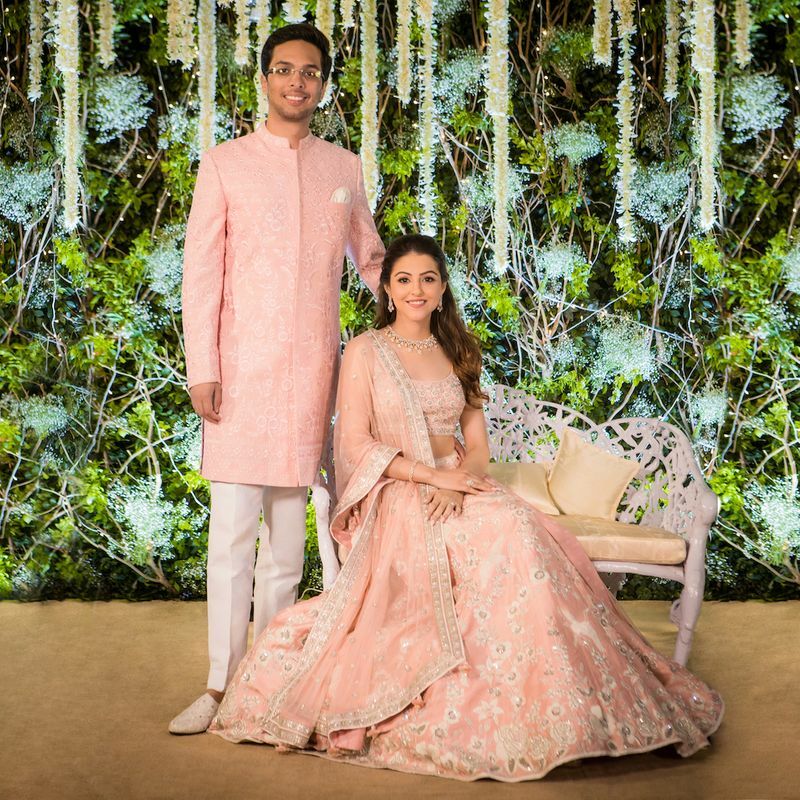 For her Reception at Seth Jeejeebhoy Dadabhoy Agiary Baug in Colaba, the bride chose a blush pink lehenga, and her groom complemented her in a matching sherwani. 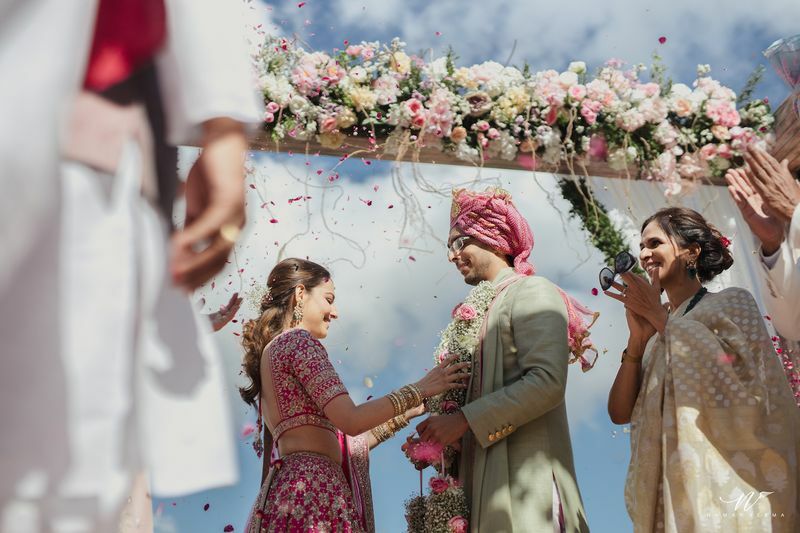 Anita Dongre explains, "The wedding reception, held at a traditional Parsi Agiary, was an ode to the couple’s different cultures. 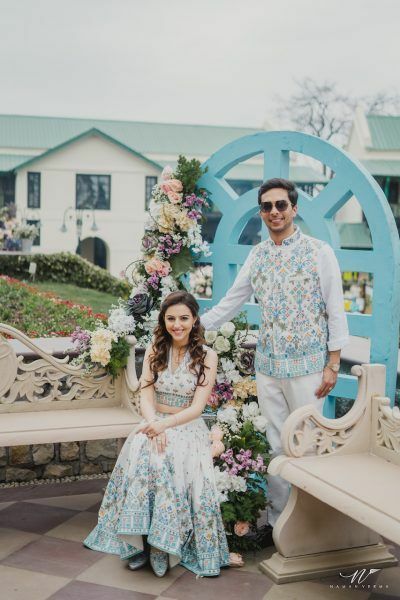 The Parsi gara motif on Benaisha’s lehenga showcased embroidered birds that harmonised with the thread work of Yash’s twinning sherwani." 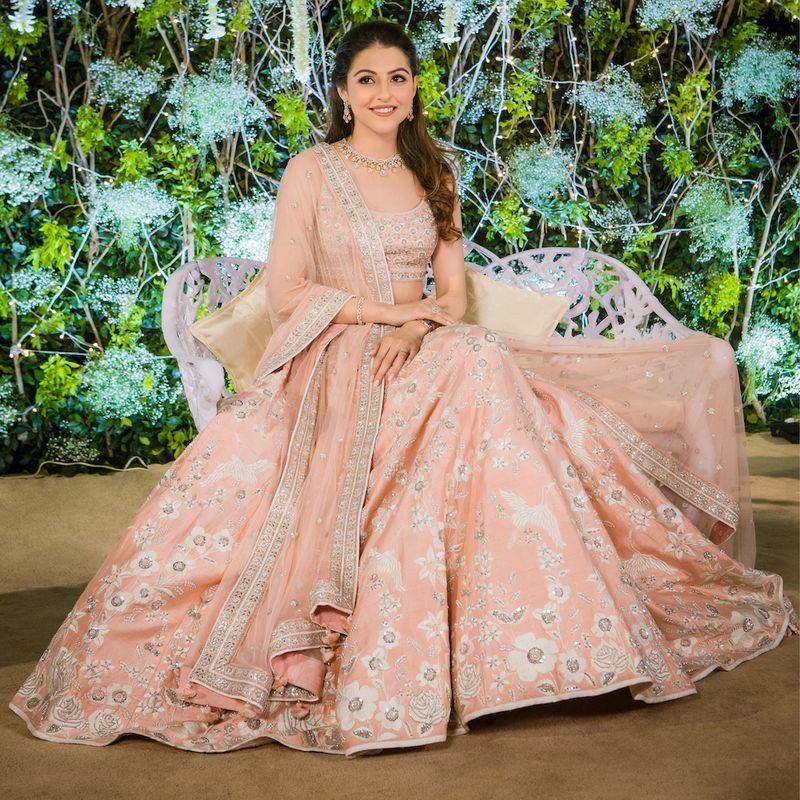 Photos courtesy Anita Dongre★ 4.9 and info originally published in Vogue with inputs from Anita Dongre's Instagram posts. 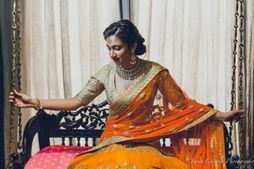 The Most Stunning Anita Dongre Lehengas Worn by Real Brides! 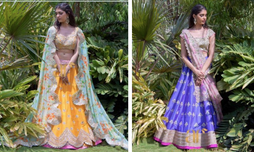 Anita Dongre Just Dropped A Limited Edition Handpainted Lehenga Collection That's Perfect For Your 2019 Mehendi! 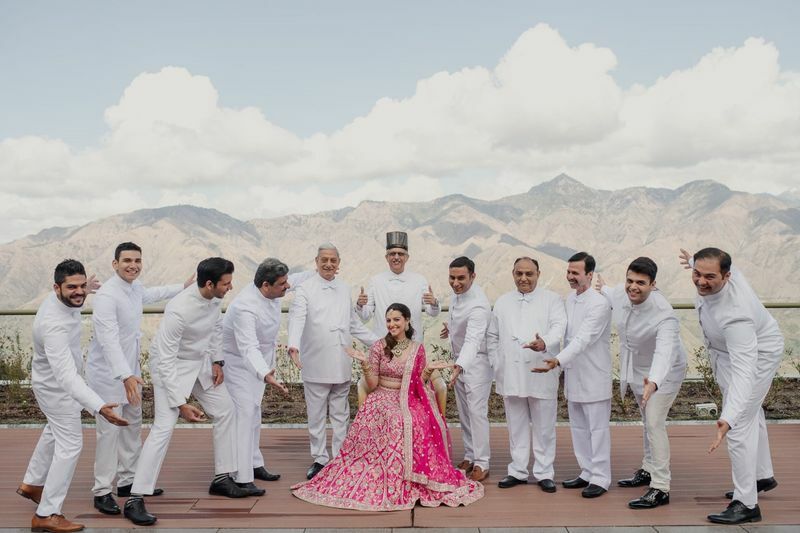 Sonam Kapoor Turns Bride for Anita Dongre in NYC and the Photos are Beyond Gorgeous! 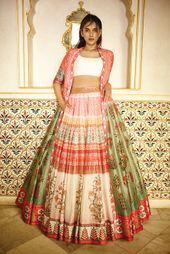 Printed Lehengas and Off-Beat Hues: What's New in Anita Dongre's New Spring-Summer LookBook? Bride-to-Be In Search Of Ideas? 5 New Look Books You Should Check Out NOW!